Forget boring mac and cheese! 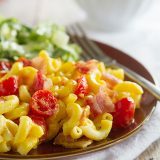 This baked mac and cheese combines cheesy macaroni with bacon and tomatoes, and then is served with a simple romaine salad. Place the bacon in a large skillet over medium heat. Cook until the bacon is crisp, then remove with a slotted spoon to a paper towel lined plate. Meanwhile, bring a large pot of salted water to a boil. Add the pasta and cook until just short of al dente. Drain. In the same pot, bring the milk to a simmer. Whisk in the turmeric. Add the cream cheese and cook until the cream cheese has melted. Stir in the cheddar cheese until melted. Add in the cooked pasta, tomatoes and cooked bacon. Stir to combine, then season to taste with salt and pepper. Transfer the mixture to a 9×13-inch baking dish. Bake until heated through, about 20 minutes. Meanwhile, whisk together the yogurt and vinegar in a large bowl. Add the lettuce and stir to coat. Season to taste with salt and pepper. Serve the romaine salad with the mac and cheese.